Mature cystic teratoma of the mediastinum showing bone, cartilage, and mucinous glands. In rare cases, sebaceous secretion causes intense xanthogranulomatous inflammation with perforation into the tracheobronchial tree. The patient may cough up oily sebaceous material and hair. Mature cystic teratoma of mediastinum has excellent prognosis. This specimen is from a 20 y/o male who presented with chest pain and cough. A chest CT showed an anterior mediastinal mass. At surgery, the tumor was attached to the thymus. 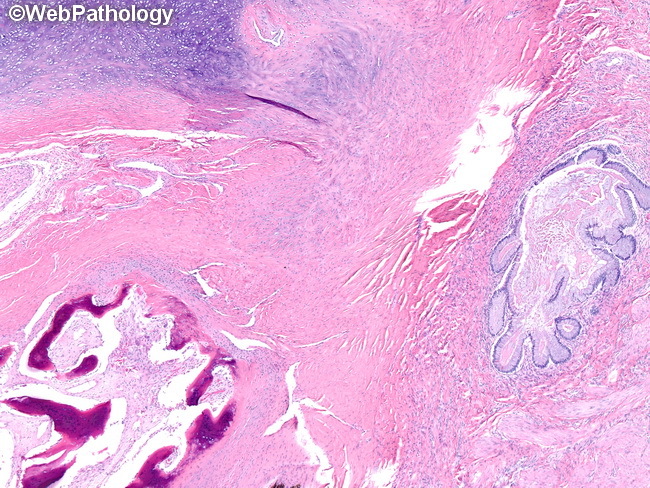 The resection specimen showed a 6 cm well-circumscribed tumor with solid and cystic areas as well as foci of bone, cartilage, and hair.